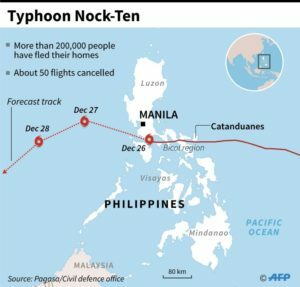 If you watched the news this past week, a super typhoon (over 120 mph winds in the center), locally known as Nina, was forecast to hit the Philippines and in fact, did reach land. It lessened to a severe typhoon as it got over land. 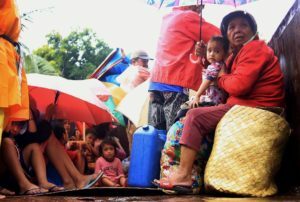 While it was in the northern end of the country and the children’s home is in the southern Philippines, they would expect to get related rain even if they didn’t get the associated winds. It inexplicably lost much of its force and the expected damage on the island of Luzon didn’t materialize. After passing into the South China Sea, it reconstituted into a strong typhoon. There were 6 confirmed dead and 18 missing from the storm. We are saddened by the loss of these individuals and our thoughts and prayers are with the families. The similar typhoon in 2013, Yolanda, had a death toll of over 6,000 deaths and 80,000 homes destroyed. 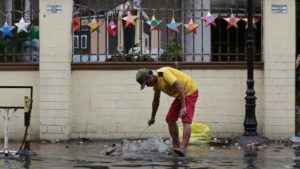 In the last 65 years, there have been 7 typhoons hit on Christmas Day, according to the Philippine government weather service.